TICKETS ARE SELLING EXTREMELY FAST - JUST ONE TABLE OF 4-6 LEFT!! See you & your friends there! Be sure to "Like" & "Share" above to help spread the word!! Includes well open bar from 9pm - 12am, access to two floors, light passed hors d'oeuvres, champagne toast, and DJ entertainment all night long. Includes everything with regular General Admission tickets, just at a great discount for purchasing 6 or more tickets together. Includes call open bar from 8pm - 12am, waitress service & reserved seating in the lounge, access to two floors, heavy passed hors d'oeuvres, champagne toast, and DJ entertainment all night long. VERY LIMITED AVAILABILITY! Limited to groups of 4-6 people only, can purchase multiple tables with multiple orders. Includes call open bar from 8pm - 12am, waitress service, reserved lounge seating with your own table and bowling lane, shoe rental, access to two floors, heavy passed hors d'oeuvres, champagne toast, and DJ entertainment all night long. VERY LIMITED AVAILABILITY! Limited to groups of 4-8 people only, can purchase multiple tables with multiple orders. Includes call open bar from 8pm - 12am, waitress service, reserved seating & bottle service (1 bottle of champagne & 1 bottle of liquor per 4-6 people) in the lounge, shoe rental, access to two floors, heavy passed hors d'oeuvres, champagne toast, and DJ entertainment all night long. VERY LIMITED AVAILABILITY! Limited to groups of 4-6 people only, can purchase multiple tables with multiple orders. Includes call open bar from 8pm - 12am, waitress service, reserved seating in the lounge area, a table & bottle service (1 bottle of champagne & 1 bottle of liquor per 4-5 people) with your own bowling lane, shoe rental, access to two floors, heavy passed hors d'oeuvres, champagne toast, and DJ entertainment all night long. VERY LIMITED AVAILABILITY! Limited to groups of 4-8 people only, can purchase multiple tables with multiple orders. Purchase this ticket if you need to add on to an existing table. Includes everything listed with normal "VIP Reserved Seating" (Lounge or Bowling Lane) tickets. DO NOT purchase this for ticket for new tables - your order will be canceled. You are REQUIRED to enter the order # & purchaser name for the original table purchase at check out. Purchase this ticket if you need to add on to an existing table. Includes everything listed with normal "Ultra VIP Bottle Service" (Lounge or Bowling Lane) tickets. DO NOT purchase this for ticket for new tables - your order will be canceled. You are REQUIRED to enter the order # & purchaser name for the original table purchase at check out. 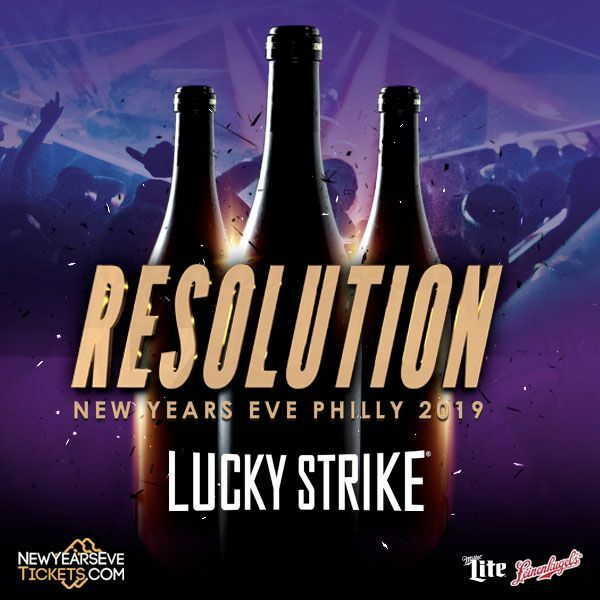 RESOLUTION 2019 is here - New Years Eve Philly 2019 at Lucky Strike in Center City Philadelphia. Grab your friends to experience this amazing two-floor venue that will host Philadelphia's hottest NYE celebration to say goodbye to 2018 and welcome 2019 right! Upgrades to VIP and Reserved Seating are available (quantities very limited). Enjoy the awesome atmosphere, while making use of the strategically placed plush seating and open bar. Also enjoy three hours of great cuisine, all on a menu designed by their chef. And it wouldn't be New Year's Eve without a champagne toast at midnight watching the ball drop on tons of screens to signal a shift in time and present you with a great way to start the New Year, partying at Lucky Strike. Additional lanes & billiards tables available on a first come first serve basis. If you want to ensure a truly celebrity celebration, choose to attend the festivities with a VIP table. Make this New Years as exciting as possible! Limited to groups of 4-6 people only, 4-8 people with bowling lane. VERY LIMITED AVAILABILITY! You can purchase multiple tables with multiple orders. 4-Hour Call Open Bar from 9pm to 12am including Miller Lite and Leinenkugel, bottled beers, mixed drinks, wine, champagne, and soft drinks. Reserved seating all night long in the Lounge area. Bottle Serivce includes 1 bottle of champagne & 1 bottle of liquor per 4-6 people. Red Bull and mixers for an additional cost. Gratuity not included (to be given that evening to the server). Coat check is available. This event will sell out - we do every year. Buy your tickets early as the price will increase. Be sure to share with friends and co-workers, we will see you there! The lounge area is breathtaking and expands throughout the entire atmosphere. You will be enchanted by the upscale bowling lounge. There is bowling, but there is also a comfortable and exciting atmosphere which is great for partying or relaxing with friends. The bowling area is extravagant and exquisite. There are 24 lanes and 12 billiard tables for game lovers. You can bowl while you enjoy the company of friends and your favorite songs. There are also 14 huge televisions and 12 projection screens that will showcase the spectacular Times Square ball drop. If you have questions about this event, please feel free to click "contact the organizer" at the top of this page. View More Events Organized by UpcomingEvents.com - New Year's Eve in Philadelphia. UpcomingEvents.com presents... New Year's Eve in Philadelphia - Philly's Best NYE Parties to ring in the new year right! This event is organized by UpcomingEvents.com - New Year's Eve in Philadelphia.